I'm taking a temporary break from updating this mod to work on other projects. I've kinda lost interest in this project, mainly because it's getting too big to properly maintain and still is far from a state I'm happy with. This means there won't be any updates for a good while, but I might come back to it some day. Candy World is a mod that adds various food items through world generation, mobs, and crafting recipes. 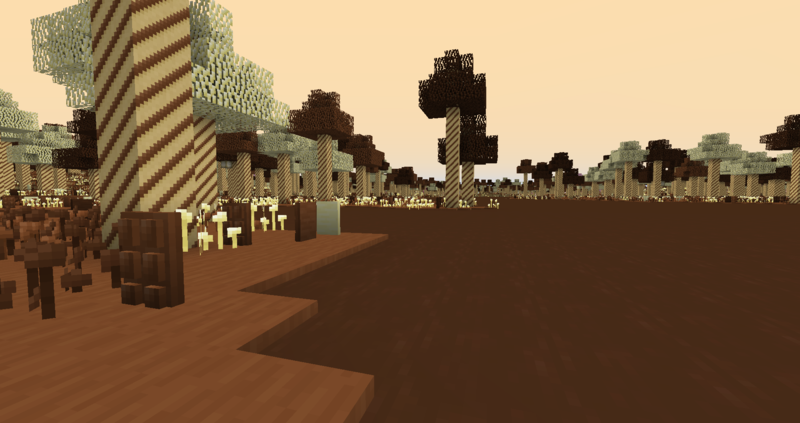 In the current version, three biomes and four mobs are added which can be found in the custom dimension, or rarely in the overworld. Below is a list which covers most features added by this mod. Almost everything added by this mod can be found in the overworld, but by travelling to the Candy World you won't have to worry about finding the biomes. To travel to this dimension you have to craft a Magic Piece of Candy, which will teleport you after being eaten. (I highly recommend using a mod like JEI to do this) This item is single use, but doesn't get consumed when travelling to the dimension, to guarantee a way back home. More of these can be found generating underground in the dimension. There are currently types of tools that can be crafted, chocolate and cotton candy. There are also new crafting tables, so you don't have to bring your own when travelling to the dimension. The tools, just like everything else in this mod, can be eaten. To do this simply sneak right-click. The amount of food restored depends on both the type of tool and its durability. The biomes added by this mod are quite hard to come by due to their rarity, but are well worth the search for the near-limitless supply of food they provide. The main food item to be found here is cotton candy. Brownies can also be found here as the soil blocks, and the trunks of the trees are made of candy cane blocks. A pickaxe is recommended to cut down the trees. Milk, white and dark chocolate are commonly found in this biome, but other items, such as wafer sticks, also generate here. Cookie ore can be found in abundance here, but can also generate in the other biomes added. New mobs can be found in the biomes added, each with their own quirks. These creatures, which can be found in the candy cotton plains, look like regular sheep, but their fur consists of cotton candy instead of wool. They can be harvested with a stick, and will regrow their fur by eating cotton candy grass or when bone meal is applied to them. Bred with sugar. Native to the chocolate forest, these chickens can lay three types chocolate eggs (milk, white and dark). Feeding them chocolate will accelerate this process. Easter chickens can be bred with wafer sticks. 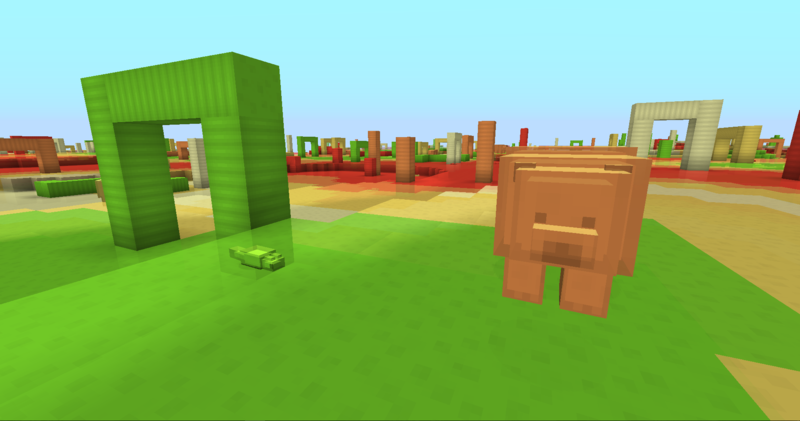 These little creatures inhabit the the gummy swamp, but will try to run away when players get too close. Gummy bears can be found roaming the gummy swamp, although they are a little rarer than their mouse counterpart. Just like the mice, they come in the five colors of gummy commonly found in their habitat. I'd love to use this but I refuse to use mods that modify the overworld. Please change it to dimensions only. Thank you for the update! I run edu -style gaming classes, and I've used your mod in a pack that includes ComputerCraft. It's a super fun pack that I call TubbiesCraft, that is intentionally chill, because I don't want children to lose interest in learning how to program their turtles. I'll post the pack soon, in the hopes that other's might find the same interest. Thank you sooo much for continuing work on this. Really means a lot to me. after all, what is candy world? Is it a dimension or biomes that generate in overwold? or both? I love it, but I do not find it sense that the biomes are in the overworld and at the same time be a dimension. I think you should choose one of the two options and focus your efforts on it. 10/10, waiting for more content. you should also add gingerbread villages for all biomes except dust if you add it that should have ruined villages with norm villagers in it. I will eventually update to 1.13, but I'll probably wait to start working on it until forge becomes stable enough. Once I update to 1.13 I will most likely drop support for 1.12 so I won't start updating until I'm happy with the 1.12 version. Either way it will definitely take a while, since the school year has begun again which means I don't have as much time to work on my mod as I would like. Loving the mod so far, I was a little surprised to find I couldn't sleep given that there's a day/night cycle, but that's understandable considering the bottomless pit of food the mod supplies. Am I right in thinking that there's no way to bring mobs back from the Candy World without third-party mods? No problem if not, still having a blast. Suggestion: Marshmallow swamp (get it?) where the marshmallows (White/Pink Slimes) spawn at night. Beds/sleeping not working is an issue I am aware of, but unfortunately do not know how to fix (yet). Using a bed should still set your spawnpoint though. Right now there isn't any way to bring back mobs (apart from finding the biomes in the overworld), I'll find a solution to that eventually. Unless you're planning to make a portal instead of the Candy to travel between world, I'm not sure how you'd do it, unless you were to make recipes for the spawn eggs themselves? It's a head-scratcher for sure. I'm not sure what's suddenly causing beds to expode, that's definitly not intended. :p They used to work, apart from not setting the time back to day (that was the issue I was talking about), but I must have messed something up in a recent update. Edit: I've fixed the issue, but I'll probably wait to release a patch because at the moment beds are almost useless anyways. Ah, good to know. Glad I could bring it to your attention. No worries on not being able to bring the mobs across dimensions, it was my decision to not have them generate in the overworld in the first place so I can understand it's not exactly going to be a priority for you to make allowances for such a niche issue.